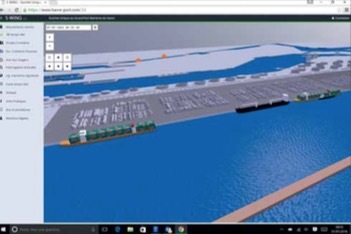 Since 16 June 2016, HAROPA — Port of Le Havre has displayed itself in three dimensions through the development of its software package S-WiNG©. This allows professionals and the general public to plunge virtually into the environment of the Normandy port, to go into the heart of its daily activities and draw a wealth of information from them. At the Port of Le Havre, vessel movements are now freely accessible and can be visualized by everyone, in 3D and in real time from a computer, a tablet or a smartphone. Every vessel present in the harbour waters is represented according to its category(containerships,oiltankers,bulkcarriers,roll- on/roll-of ships, dredgers, tugs, barges, liners, ferries, etc.) with its draught, according to the real water level, the swell and the weather. Ergonomic, user-friendly and interactive, the S-WiNG – 3D application allows the user to look by a single click at the information linked to each vessel present in the tidal basins of the port zone, notably in the outer port, and at Port 2000, sailing in the basins or at berth (vessel length, width, capacity, origin, destination, etc.). Some functions such as position of the cranes that operate the vessels are also searchable but reserved for the relevant professionals. All the information is available in real time but also in replay, thus allowing to go back in time and to view past calls a posteriori (back to two weeks). The tool enables all professionals of the port community to follow the activity in real time, and teachers and school children to understand the port life in a recreational way. It also offers tourists and other ship lovers the chance to discover the port from a new perspective. Fortherecord,thesoftwarepackageS-WiNG© developed by the teams of HAROPA – Port of Le Havre, is a port authority single window used by the whole community — sailors, pilots, linesmen, tugs, shipping agents, ship-owners, logisticians, customs officers, stevedores, port officers, authorities, internal users, policemen and custom officers — for collection of declarations, the management, planning, organization and operational monitoring of the sea and river calls. At the heart of the port information systems, it co-ordinates all the operations and events relating to a call. Bringing an effective and secure answer to the growth in volume and flows, S-WING today constitutes the key- element of the digital port. Marketed by the port of Le Havre, the software has already been installed in other French and foreign ports including Nantes and Abidjan. With S-WiNG-3D, HAROPA resolutely establishes itself as the connected port of the future. Owing to its outstanding location on the West-European sea board, HAROPA-Port of Le Havre is the number one French port for external trade and number five North-European port for container traffic. Each year it accommodates around 6,000 vessels among which the world largest containerships. Accessible 24/7, it handled about 70 million tonnes of cargo in 2015 and almost 40 % of the French imports of crude oil. Being a member of HAROPA, the leading French port system, together with Rouen and Paris, Port of Le Havre offers an easy and fast gateway to all continents for all world major shipping lines with around 600 ports of call worldwide. As one of the biggest European port systems, HAROPA has almost 500 hectares of estate available or likely to be developed along the Seine corridor. It helps its customers setting up and managing competitive and sustainable logistics systems to serve the N°1 European consumer basin with 25 million inhabitants.